Life is full of unexpected moments. For Cheltzey and Nich Clements, the first was finding each other and falling in love when they both worked at the same grocery store. Cheltzey already had a young daughter, Addalynn, but she and Nich knew they wanted another child. Last year, they found out the joyous news that they were expecting a little boy. Nick wasn’t originally supposed going to make it to that ultrasound appointment but he was able to get off work at the last minute. It was at that time that doctor’s saw something unusual. It appeared that Nich and Cheltzey’s little boy didn’t have the left side to his heart. 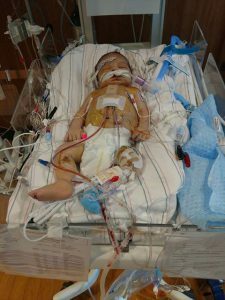 The doctors diagnosed Reed with hypoplastic left heart syndrome (HLHS) and it affects blood flow through a baby’s heart, causing the left side to form abnormally. Often, HLHS patients have other complications but Reed did not. Cheltzey’s doctors aren’t sure what caused Reed’s condition. According to the Mayo Clinic, most HLHS cases will never know the cause. Some cases are caused by genetic factors while others are caused by environmental factors. The couple was referred to doctors in Birmingham for further testing. Doctors at Children’s of Alabama told Chelsea that she needed to travel to them frequently to get specialized care. Amazingly, unexpectedly, each time she saw Dr. Carlo, a pediatric cardiologist, he felt that little Reed was doing well. They had hope. Cheltzey made it to full term and Reed was born June 28. Then the real work and stress began. Reed had in fact developed the left side of his heart but the HLHS had affected it so much that Reed still needed to undergo open heart surgery. Afterwards, doctors had to leave his chest open and told the family this was the most uncertain time for Reed. Thankfully, he made it through and started his recovery. Cheltzey says the family and nurses would celebrate every time Reed came off a monitor or tube. He also had to make the transition from a feeding tube to regular feedings. 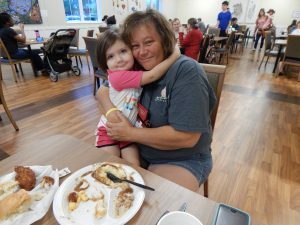 Through it all, Nich and her mom, Betty, and daughter Addalynn were also staying at the Ronald McDonald House and supporting one another and Reed. 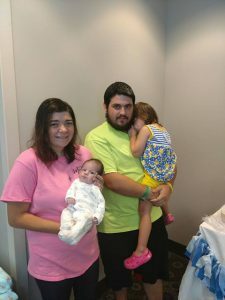 The family lives about two hours and a half away in Centre, Alabama and Chelsea says they could not have afforded to pay for a hotel while Reed was in the hospital. One of the moments Cheltzey remembers most from that first stay was from Fourth of July. Children’s of Alabama happens to be a great vantage point to watch the annual Thunder on the Mountain fireworks show and Addalynn really wanted to see the fireworks so Nich was trying to persuade Chelsea to come outside with them to enjoy the show. She says she resisted at first because it would mean leaving Reed. “We went and saw the fireworks. You would think watching the fireworks was the main show of the night. But watching at Children’s, you’re surrounded by a lot of sick kids and that’s their first time outside in a while. They’re all around each other and happy to be outside. Yeah, we were celebrating July the Fourth. But at Children’s, everybody was celebrating that they still had their kid. And that’s what I celebrated. Those fireworks meant that Reed had lived,” Cheltzey said. Nich convinced her to come to the House after that for some rest. Cheltzey hadn’t left Reed’s side since the surgery. “It was the first time that I had felt at peace at all. Everything could have been so much worse but it wasn’t. I was able to rest for one full night,” she said. The Clements family has stayed at the Ronald McDonald House three times since Reed was born and they expect to return for years to come. He will need more surgeries and further care for his heart. Cheltzey says the Ronald McDonald House has helped her family in deeper ways than just saving money for Reed’s care. “We’ve made so many memories here. And all the extra stuff they do for the siblings. 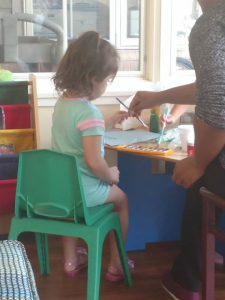 Addalynn does crafts, she meets other kids she can play with,” Cheltzey said. Addalynn has been asking to learn how to ride a bicycle. 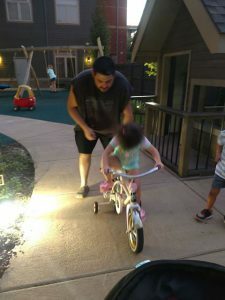 And since the Ronald McDonald House has several donated bikes, Nich was able to teach her! “The Ronald McDonald House has kept us together and fed. And now, we have so many friends here. And we know we’re going to be here a lot in the future and this is like home. I feel just as comfortable walking around the Ronald McDonald House as I do in my home. I get to go about my daily routine while I’m here. I love to cook so I can just get up and cook if I want to. We would not have been able to live a normal life without the Ronald McDonald House,” Cheltzey said. Cheltzey has even met another HLHS family here and been able to talk with them. She says the friends they’ve made at the Ronald McDonald House are family now. Even when they’ve gone home, the family will FaceTime with some of Addalynn’s friends. We hope you’ve enjoyed reading about Reed and his family. 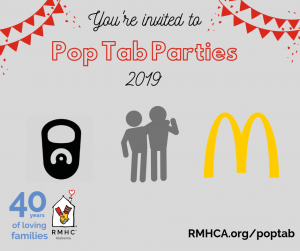 Please consider volunteering or donating today to help RMHCA continue to life some of the financial and emotional burdens of having a sick child.